Can there be hope and rebirth after betrayal? Juliana Sutton’s life looks perfect—from the outside. Until her husband’s untimely death reveals a devastating truth. . . . Cass Gregory is carrying his own dark secrets and feels unworthy to offer comfort to a woman of Juliana’s standing. When circumstances force them together, both Juliana and Cass are wounded and afraid to trust. Will the shadow of her dead husband’s name stand between Juliana and Cass, or will Juliana choose a love she never thought possible? 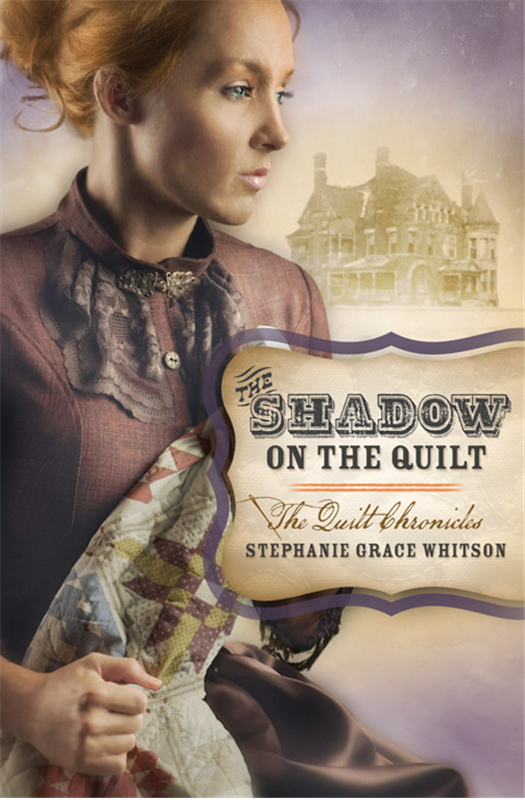 Stephanie Grace Whitson's first Quilt Chronicles novel, The Key on The Quilt was an inspiring and enjoyable read for me (see review) and I knew book number two would not disappoint. 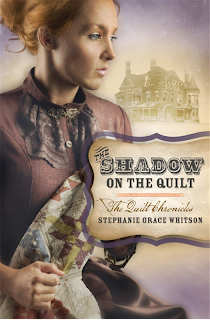 The Shadow on the Quilt is a stand alone novel featuring new characters, with the main protagonist Juliana struggling with the knowledge that her recently deceased husband was cheating on her. As she dons her widow's weeds, Juliana is forced to deal with her grief but also the betrayal of her husband while everyone around her only sees her husband as a loving, doting man and a great loss to their town. Juliana is left with the pieces of her life and she admiringly comes to terms with the legacy that was left to her. The ostentatious house that Sterling was building for them is not something she desires, and with the help of Sterling's family they are able to find a good use for the building. Overseeing the construction is Cass Gregory, and they develop a good working relationship with each other. Sterling's mistress Jenny comes on the scene as an intriguing subplot, and things don't work out as beneficially for Jenny as she hoped for. As a fallen woman, there is little hope for her survival unless the community can come together and offer a lending hand. This subplot and the slow romance budding between Juliana and Cass offer a quaint story of forgiveness and hope that leaves a mark on the reader's heart, especially with the biblical quotes interspersed throughout. These messages of lost sheep, the Good Shepherd and repenting sinners are well portrayed in this gracefully told story which offers both tears and joy throughout the telling. Although this inspirational novel follows a bit of a predictable slant, the supporting cast of characters are vast and on a whole this offers a satisfying inspirational love story set amidst a turn of the century setting of Nebraska.